In 1998, the Father of Strengths Psychology, Donald O. Clifton, Ph.D. (1924-2003), along with Tom Rath and a team of scientists at Gallup, created the online StrengthsFinder assessment. In 2004, the assessment's name was formally changed to "Clifton StrengthsFinder" in honor of its chief designer. In 2007, building on the initial assessment and language from StrengthsFinder 1.0, Rath and Gallup scientists released a new edition of the assessment, program, and website, dubbed "StrengthsFinder 2.0". StrengthsFinder 2.0 instantly became a Wall Street Journal, Businessweek, and USA Today bestseller. It is the bestselling non-fiction book of all time on Amazon. Rooted in more than 40 years of research, this assessment has helped millions discover and develop their natural talents. 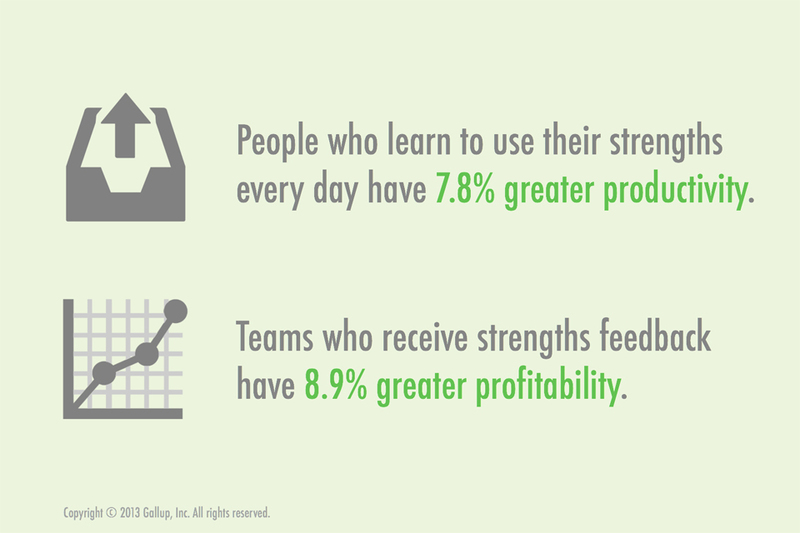 Gallup has published more than half a dozen books focused on strengths-based development in various roles. All of these books have used the Clifton StrengthsFinder® as the cornerstone of strengths discovery and personal improvement. 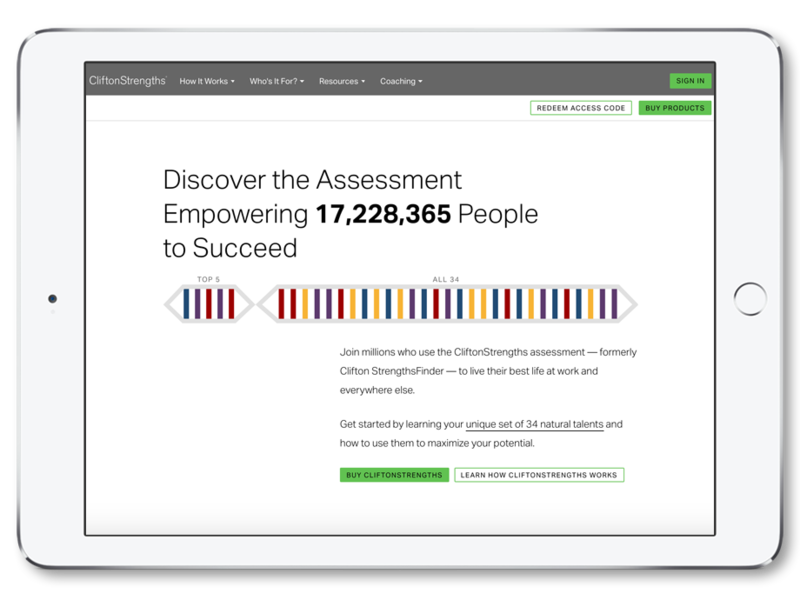 CliftonStrengths® is a web-based personality assessment from the perspective of Positive Psychology. It is designed to measure the presence of talents in 34 general areas referred to as "themes". Talents are ways in which we naturally think, feel, and behave as unique individuals and they serve as the foundation of strengths development. Over a secure connection, CliftonStrengths® presents 177 items which consist in a pair of potential self-descriptors, which are placed as if anchoring polar ends of a continuum. You are then asked to choose the descriptor that best describes you, and to identify the extent to which that chosen option is descriptive of you. You are given 20 seconds to respond to a given pair of descriptors before the assessment automatically presents the next pair. Upon completing CliftonStrengths® assessment, you will receive a report displaying your top five (most dominant) themes. You then have the opportunity to delve into those themes to discover your greatest talents. Both the assessment and the report of your top five themes are designed to help you learn about and build upon your greatest talents in order to create strengths that will enhance all aspects of your life. People exceptionally talented in the Consistency theme are keenly aware of the need to treat people the same. They try to treat everyone with equality by setting up clear rules and adhering to them. People exceptionally talented in the Focus theme can take a direction, follow through, and make the corrections necessary to stay on track. They prioritize, then act. People exceptionally talented in the Harmony theme look for consensus. They don’t enjoy con ict; rather, they seek areas of agreement. People exceptionally talented in the Ideation theme are fascinated by ideas. They are able to nd connections between seemingly disparate phenomena. People exceptionally talented in the Self-Assurance theme feel confident in their ability to manage their own lives. They possess an inner compass that gives them confidence that their decisions are right. People exceptionally talented in the Significance theme want to be very important in others’ eyes. They are independent and want to be recognized. Clifton StrengthsFinder®, StrengthsFinder®, CliftonStrengths®, and each of the 34 CliftonStrengths® theme names are trademarks of Gallup, Inc. Discover what makes you unique and powerful.